I recently had the Kodak Z650, turned it on and checked out,started to takea picture, and WHOA! GREEN?! I don't think i've ever used a camera with a green a/f illuminator, I thought it was all orange!.....so, what else is out there, and which color is best? My Z612 is a bluish white and I do know that some cameras use a yellowish white color. I have seen nothing to indicate that the choice of LED illuminator color has anything to do with the low light focusing capability of a particular camera. 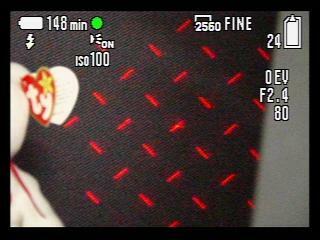 My Sony A700 projects a pattern with both thinner and wider vertical red lines. It's probably optimized specifically for the Autofocus Sensor Asembly being used in this camera body. A non-DSLR model uses a contrast detection based system instead, with the camera's main imaging sensor used for Autofocus (versus a separate sensor for Autofocus in a DSLR model). Green light could very well be the best color to use for autofocus. The Bayer pattern sensors have green pixels for half the pixels, so this should give you the most sensitivity and best contrast, as opposed to either red or blue. Just a guess, though.